We are a division of Surplus Equipment Company, a leading distributor of Lozier Store and Pharmacy Fixtures, Monaco Hang Bags, Athletic Training Equipment, Exam Room Furniture, Healthcare Carts, Healthcare Seating, and Narcotics Cabinets. We created RxShelving.com to provide an easy to use one stop shop for all your healthcare related equipment needs. Most of our customers enjoy the "self-serve" nature of the web site, however, if you prefer a personal contact just give us a call. We are always happy to help with layout and design! Just provide us with a rough sketch of your location including room dimensions and locations of doors and windows as well as any obstructions (columns, etc.). We will create a suggested layout drawn to scale and send it back with a quote. You can send your sketch by Email or fax them to 314-534-0583. Lozier display shelving in Tier Two colors add a unique touch of style to your retail space.The retail display fixtures you choose are key to setting the right mood in your store. Whether you want something warm and inviting like our natural line or fun and colorful with our contemporary line Lozier display shelving has a color for you! Lozier Shelves are offered in two position (TL) and multi-position (DL) styles. 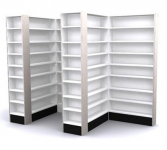 Shelves have double rows of perforations on 1" centers at the front and rear edges to accommodate vertical dividers, binning, and product retainers. Improve patient care and increase profitability in your pharmacy with Lozier pharmacy products. 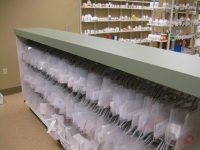 Our pharmacy fixtures are designed to optimize storage and work flow from the dispensing area to the retail sales floor. We carry a complete line of Lozier component parts for standard store fixtures. Order back rails, uprights posts, upright extensions, end trims, base brackets, decks, and covers. From pharmacies to healthcare facility applications, FireKing Pharmacy Safes, Files and Medical Storage products provide security and safety for medications and confidential medical files. We offer a full range of storage solutions for any size facility no matter how large or how small. From backroom shelving to stainless steel cabinets we are your solution to your storage problems! We are pleased to represent Quantum Storage products. We offer a wide selection of dividable bins & drawers that are ideal for storing patient supplies, medication, and small parts. Clinton Complete Pediatric exam rooms make setting up your pediatric practice easy and fun. Completely coordinated, cost effective, and kid friendly! Our phlebotomy chairs and carts are designed with the comfort and safety of patients and clinicians in mind. Options to fit any budget! Clinton training room furnishings are designed to please busy AT professionals and athletes. They are also perfect for family practice facilities working within budget. We offer a complete line of mobile transport solutions for the hospital, healthcare and education markets from Waterloo Healthcare, Lakeside, and Harloff. Click through to see all our medical and healthcare carts. All commercial settings need floor mats. Pharmacies, Mail Rooms, Service Counters, Banks, and retail stores all use floor mats for employee comfort. Anti-Fatigue mats reduce worker fatigue, body aches and pains, and lower absenteeism rates. We offer a complete line of narcotics cabinets, secure storage, and medical storage cabinets. Our modular taping stations fit any space and can be easily changed or relocated as your needs change. Our treatment tables come in a variety of styles to fit any decor and budget. The Lozier S-Series shelving offers economy without sacrificing strength. Particle board shelves are reinforced with steel channels front and back. Once piece all steel uprights are pre-assembled for ease of installation. Wide Span shelving is the solution for back stock and bulk stores! 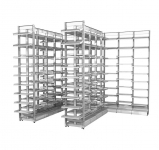 Widespan shelving bridges the gap between conventional shelving and pallet rack. Every facility needs a place for students, staff, and team members to keep their belongings. Lockers are the perfect solution! We have lockers for every need. Prevent losses and improve safety with one of our safety mirrors. Work happy! Comfortable seating is essential for healthy, productive employees. Chairs and stools for all environments from hospital to office are just a click away! Get organized, improve production, or display your inventory with style! Start with our super strong wire shelving units, add bins or accessories to create the perfect storage and display system.